The Girl’s team led on the first day of the Liberty District championship by three points (53 – 50) but end up finishing 3rd in the team scoring with 74 points with only 4 girls scoring. Also, the girl’s team led most of the way at the Northern Regional championship but ran out of athletes, finishing 6th with 40 points. Every female team member that compete at Regionals collected a medal. **Junior Brittany Johnson earned All State Honors at the VA AAA Indoor State championship – 6th with a personal best of 5ft 4in. Runner up in the high jump at the Liberty District and the Northern VA Regional Championship, was runner up in the Liberty District High jump, and High Jump, Northern Virginia AAA Regional Long jump runner up, Northern Virginia AAA Regional triple jump bronze medalist, Northern Virginia AAA Regional High jump medalist (4th place), Metro Run and Walk Invitational High jump winner. Liberty District 55m and 300m runner up, Northern Virginia AAA Regional qualifier in five (5) events – LJ, TJ, HJ, 55m and 300m, state qualifier in the long jump, triple jump and high jump. **Senior Nicole Brown was runner up in the 55m hurdle at the Liberty District championship and bronze medal in the Northern Virginia AAA Regional 55m hurdle and qualified for the State meet. Also, Brown placed 3rd in the Liberty championship, 3rd in the Northern Virginia AAA Regional championship, qualified for VA AAA State championship in the shot put. Ranked #2 Liberty District, Ranked #5 Northern Regional in the shot put, she was also a medalist in the 500m dash at the Liberty District title and qualified for the regional championship, she complete in the LJ, TJ, HJ, SP, 55m hurdles and the 500m dash at the Liberty District championship. **Senior Aaron Anderson broke the school record in the 55m hurdles three times, medaled in the 55m hurdles at the Liberty District and Northern Regional championship, automatically qualified for the Liberty District 500m dash, had the team best performance in the 55m dash, 55m hurdles, 300m dash, 500m dash and the long jump (19ft 1in and finished 8th in at Liberty District championship). **Sophomore Courtney Herbolsheimer qualified for the Northern Virginia AAA Regional championship in the 1000m and 1600m. Liberty District medalist in 1000m and 1600m run, won four quad meet events, runner up three times and a third. **Senior Daniel Farhood placed 9th in the Liberty District triple Jump. The Girl’s team won the Liberty District championship, the first time in eleven (11) years. The Boy’s team finished 5th in the championship. **Senior Jacqueline Hargrove scored 52 points to lead the team. She won the 300m & Shot Put and finished 2nd in the LJ, TJ, HJ, 55m and 4x400m. Set a meet and school record in the 300m dash (41.01). Qualified in eleven (11) events for the Regional and four (4) events for the State championship, won the 300m & 500m @ the Asics Invitational and the 500m & High Jump @ the Southern Mega Invitational. Regional runner up in the 500m and medal in the Long jump and 4x400m relay. **Junior Shannon McVey won the 55m dash at the Liberty District championship and set a school record and was runner up in the 300m dash. Qualified for the Regional and State meet in the 55m, 300m, 4x200m and 4x400m. **Sophomore Tara Cappiello set a new school record in the 1000m at the Regional championship and collected a bronze medal at District. **Freshman of the Year Brittany Johnson qualified for Regional and medal in the 55m dash, 4x200m and High Jump at the Liberty District. **Junior Ann-Elise Gustavsen Lauren qualified for Regional and medal in the shot put at the Liberty District. **Junior Katherine Heffelmire tied her school record and qualified for the regional championship in the pole vault. **4x200m relay team of McVey, freshman Brittany Johnson, sophomore Chandler Dennison, senior Jamie Schiller and senior Shannon McVey won silver medal at District and qualified for regional championship. **4x400m relay team of Schiller, sophomore Crystal Courtner, Jacqueline Hargrove and Tara Cappiello won silver medal at District. **4x800m relay team of Cappiello, Courtner, senior Tanya Khandpur, Dennison runs the fastest time in seven (7) years. **Junior Lance Cheng won the Liberty District triple jump title and qualified in the 55m hurdles and triple jump. **Sophomore Alexander Saures medal at District & the regional championship and qualified for the State championship. The girl's team finished 7th and the boy's team finished 8th in the Liberty District Championship. **Senior Jacqueline Hargrove completed her high school career winning the Liberty District title and breaking her school record for the final time with a personal best and championship record 58.04, qualified for the Northern Virginia AAA Regional and State championship, finishing 9th in the 400m dash at the State meet, won the 400m dash at TJ Pentiultimate experience, 2nd at the TJ Pentiultimate Long jump. **Freshman Brittany Johnson qualified for the Virginia AAA State championship in the 100m dash and the High jump championship, 3rd in the 100m dash, runner up in the High jump and 6th in the Long jump at the Liberty District Championship, 4th in the High Jump and 5th in the 100m dash at the Northern VA Regional championship. Girl's and Boy's team finished 3rd and 6th, respectively in the Indoor Liberty District Championship. **Junior Jacqueline Hargrove won her 3rd straight 55m dash crown and set a meet record in winning the 300m dash, qualified for the State meet in the Long jump medal in the Long jump at Regional. Hargrove automatically qualified in six events, competed in seven events, winning seven medals in seven events (LJ, TJ, HJ, SP, 55m, 300m, 4x4) at District championship. **Junior Shannon McVey qualified for the State meet, finished collect a 4th place medal at Regional and was runner up in the 55m dash @ District. **Freshman Tara Cappiello qualified for the Regional championship and medal at District. **Junior Lauren Byrne qualified for Regional and collected a bronze medal at District. **4x200m relay team of McVey, junior Gina Cappiello, junior Jamie Schiller, Hargrove broke their own school record. **4x400m relay team (McVey, Jamie Schiller, T.Cappiello, Hargrove) won bronze medal at District. **Sophomore Katherine Heffelmire became the first woman in Statesmen school history to clear a height in the pole vault (6ft 6in). **Senior Theo Robinson qualified for the States, medal in the regional and District meet in the high jump, automatically qualified for District in the triple jump, high jump and long jump (medal at District). **Senior Joel Ryan and junior Kevin Gollogly medal at District and qualified for Regional in the 500m dash. **Senior Brandon White medal at District and qualified for regional in the shot put. **Sophomore Lance Cheng medal at District and qualified for regional in the triple jump. **Junior Oscar Olazo was named Most Outstanding Player and automatically qualified for District in the 500m and 1000m. **4x800m relay team medal at two big meets (George Mason Invitational and Keydets (VMI) Invitational). **Junior Jacqueline Hargrove won the 200m and 400m dash at District. Broke her own school record in the 400m dash and automatically qualified for state in the 400m and Long Jump, finished runner up in the long jump at Metro Run and Walk Invitational, C.H. Flowers Invitational, Nike Spring Invitational and T.J. Pentiultimate Experience, qualified for the State meet in the Long Jump, High Jump, 400m and 200m dash. **Lauren Byrne finished 4th in the shot put at District and T.J. Pentiultimate Experience, qualified for regional championship in the shot put (5th @ Districts). **The girl's 4x800m (Junior Tanya Khandpur, Hargrove, junior Jamie Schiller, freshman Lisa Carter) ran the 2nd fastest time in 6 years. **Freshman Lisa Carter and Allyse Golden had wonderful season. **4x800m team of sophomore Oscar Olazo, junior Alex Cvrk, sophomore William "Alex" Haugh, junior Jason Pennington won the T.J. Pentiultimate Experience in a school record and regional qualifying mark of 8:10.28. **Sophomore Oscar Olazo finished 2nd at the Liberty District and the T.J. Pentiulimate Experience 800m run and automatically qualified for the District in the 200m, 400m and 800m. Finished 8th in the 800m run at regional in a personal best of 1:58.86. **Senior Theo Robinson finished runner up in the high jump at District, won the Metro Run and Walk Invitational and medal at Nike Spring Invitational, C.H. Flowers Invitational and Thomas Jefferson Pentiulimate Experience, qualified for the regional in the high jump. **Junior Jason Pennington finished 3rd in the Liberty District 1600m and 800m run at the Liberty District championship. He missed making the State meet by one spot in a personal best 4:27.81. **Senior Brandon White qualified for his 5th regional championship and medal at Nike Spring Invitational, Thomas Jefferson Pentiultimate Experience and Liberty District championship. **Sophomore Lance Cheng qualified for the regional in the triple jump and medal at Liberty District. **Freshman Lex Saures had a wonderful season with 40ft shot put and 110ft Discus. **Sophomore Willim "Alex" Haugh and Daniel Haugh had wonderful season running sub-5 minutes 1600m run and 10:19 and 10:36 for the two mile. Girl's and Boy's team finished 4th and 7th, respectively in the Indoor Liberty District Championship. Highlights of the season were sophomore Jacqueline Hargrove won District title in the long jump and defended her 55m dash title. Hargrove earned All State honors in the 500m (5th), runner up in the Northern Virginia triple jump, bronze medal in the Long Jump and 500m dash at Regional. The girls 4x4 team of sophomores Shannon McVey, Gina Cappiello, Jamie Schiller and Jacqueline Hargrove won the District title. The same four members got together and captured a 6th place medel while breaking the school record in the 4x200m. Hargrove broke her own 200m, 300m, 400m and 500m school records, grab four medals at Regional including a runner up in the triple jump by 0.25 inches. Senior Andrew Coatsworth, junior Theo Robinson (High Jump runner up) and sophmore Shannon McVey captured three medals at District and qualified in the same for Regionals. Sophomores Lauren Byrne, Jason Pennington and Kelly Wiencek medal at District and qualified for regionals. Boy's and Girl's team finished 5th and 7th, respectively in the Outdoor Liberty District Championship. Highlights of the season were Boy's 4x800m (Oscar Olazo, Joel Ryan, Alex Cvrk, Jason Pennington) relay team won the District title and broke 27 year old school record by four seconds. Sophomore Jacqueline Hargrove broke the 800m school record and was runner up in the 100m dash @ District, also medal in the 400m @ regional and qualified for 200m & 400m for States. Junior Theo Robinson finished runner up in the high jump and 6th in the long jump. Sophomore Jason Pennington placed 3rd and 5th in the 800m and 1600m @ District. Freshman Oscar Olazo, freshman William "Alex" Haugh, junior Brandon White, junior Jerone Kadnar and senior Amanda Zirzow medal @ District and qualified for the Northern Virginia championship. Boy's and Girl's team finished 5th and 7th, respectively in the Indoor Liberty District Championship. Highlights of the season were one District Championship crown (Freshman Jacqueline Hargrove -55m dash) and twelve (12) Northern Virginia Regional and two (2) Virginia AAA State Qualifiers. Freshman Jacqueline Hargrove broke the school record in 300m, runner up at Northern Virginia (300m), competed in 55m and 300m at States and 200m and 400m at Nationals (New York). Senior Doug Shapiro and Junior Andrew Coatsworth were runner ups at the District Champs. All freshman team of Gina Cappiello, Elizabeth Blair Monroe, Jacqueline Hargrove, Kathryn Fay and Jamie Schiller finished runner in the 4x200m and 4x400m relay at District. The Boy's 4x400m team of Junior Andrew Coatsworth, Sophomore Joel Ryan, Senior Doug Shapiro and Junior Devin Mawdsley qualified for Regional. Sophomore Theo Robinson placed 3rd in the high jump and 6th in the Long jump at District. Girl's finished 4th and the Boy's finished 5th in the Liberty District Championship. Freshmen Jacqueline Hargrove (100m, 200m) was crowned Liberty District champion in two (2) events. Athletes qualified for the Northern Virginia Regional Championship in fourteen (14) events. Hargrove broke the school records in the 200m and 400m and collected three bronze medals at regional. She qualified for three events (200m, 400m, Long Jump) for the State Championship. Freshman Nicole Harrison medaled in three events at District (High Jump, 100m, 400m). Junior Kaitlyn Johnson (Shot Put, Discus), Sophomore Theo Robinson (Long jump and High Jump) and Senior Doug Shapiro (1600m, 4x400m) medaled in two events. Freshman Jacqueline Hargrove was George C. Marshall Women's Athlete of the Year. Boy's and Girl's team finished 5th and 7th, respectively in the Indoor Liberty District Championship. 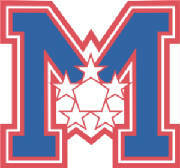 Highlights of the season were three (3) District Championships (Anthony Weaver 300m, 500m & Tim Silver (Shot Put) and seven (7) Northern Virginia Regional and three (3) Virginia AAA State Qualifiers. Anthony Weaver (300m, 500m) earned two All-State honors and one All-American honor (400m). Boy's finished 6th and the Girl's finished 7th in the Liberty District Championship. Tim Silver (Discus, Shot Put) was crowned Liberty District champion in two (2) events. Five athletes qualified for the Northern Virginia Regional Championship. Tim Silver and Jalen Boone (Discus, Shot Put) were named George C. Marshalls Men & Womens Athlete of the Year. Boy's and Girl's team finished 6th and 7th in the Liberty District Championship. Chris Barham and Carissa Culbreath were crowned District Champions in the Shot Put. Matt Schiller was the runner-up in the 300m dash. Five (5) athletes qualified for the Northern Virginia Regional and two (2) athletes qualified for the Virginia AAA State Championships. Carissa Culbreath (Shot Put, Discus) repeated as Liberty District Champion and A.J. 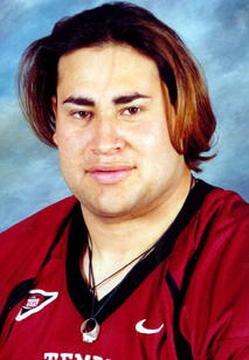 Wallace gained his first in the Discus. Tim Silver was the runner up in the Discus. Chris Barham finished 2nd in the Shot Put and 3rd in the Discus. Thirteen (13) athletes qualified for the Northern Virginia Regional and three made it to the Virginia AAA State championship. Culbreath earned All-State honors with her 6th place finish in the Discus. Tim Silver made the finals of the Discus competition. Culbreath would be named George C. Marshall Female Athlete of the Year. The Boy's team placed 5th and Girl's team 6th in the Liberty District Championship. Both team finished 7th in the Liberty District Championship. Chris Barham (Shot Put) was crowned Liberty District Champion. Carissa Culbreath was runner-up in the Shot Put. Six (6) athletes qualified for the Northern Virginia Regional Championships. The Girl's and Boy's team finished a remarkable 12th and 20th, respectively in the Northern VA Regional Outdoor Championships. The girl's team finished 6th and the Boy's team finished 7th in the Liberty District Championship. Carissa Culbreath (Shot Put, Discus) was crowned champion in two events and Chris Barham added the Outdoor Shot Put title to his resume. Doug Shapiro and Chris Barham finished runners-up in the 1600m and Discus. Tim Silver and Micah Peterson finished 3rd in the Discus and 200m, respectively. Six (6) athletes would qualify for the Northern Virginia Regional and four (4) qualified for the Virginia AAA State Championship. 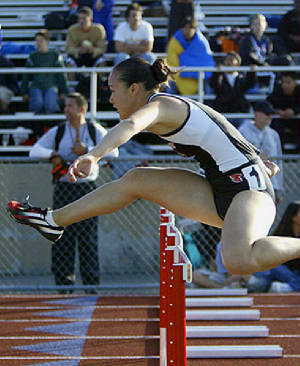 As the head coach of the George C. Marshall Boy's and Girl's track team, Coach Wong brings extended experiences at various competitive levels. 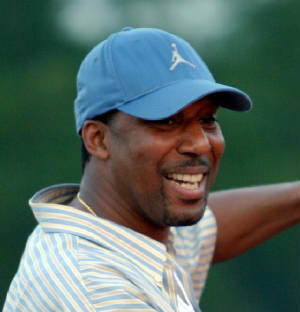 The highlight of his running career was representing his native country of Guyana (South America) as a member of 1996 Atlanta Olympic Team (4x400m Relay). His collegiate career includes four (4) conference team championships, two (2) times 400m dash champion, 8 times relay champion and two gold watches won at the Penn Relays. Wong was selected five (5) times to the All-Eastern team in the IC4A conference. At Forestville High School in Prince George's County, Maryland, he was a seven (7) times State champion and led his school to two (2) state and three (3) regional championships. He was a state record holder in 400m dash and members of the record setting 400m relay and 1600m relay teams. 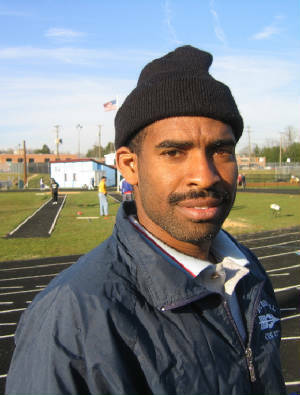 Coach Wong was coached by one of the world's leading authorities on multi-events competition, Jim Deegan, Mike Merritt (Head Coach at Howard U) and Peter Rono (1988 Olympic 1500m Gold Medalist). 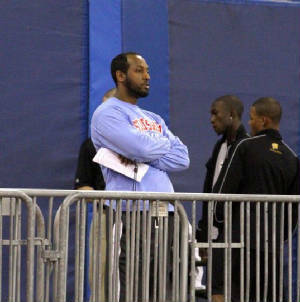 Jump Coach Theodore Robinson, Sr.